35-year-old wrestler Becky Lynch made history after she won the headline Winner Takes All match at the WWE’s first ever all-female event, WrestleMania 35. 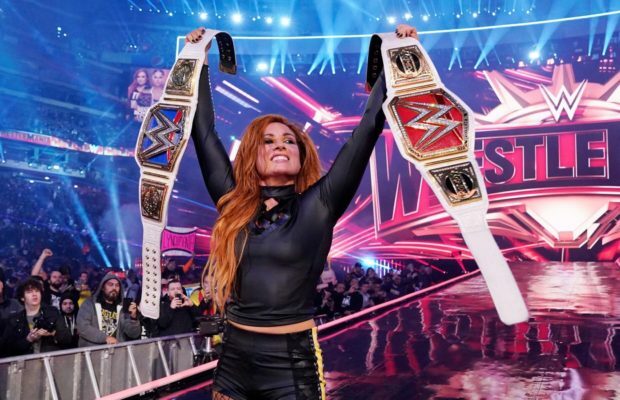 Limerick-born wrestler Becky Lynch made history at WrestleMania 35 when she won the headline Winner Takes All match during the WWE’s first ever all-female event. In what was the first Wrestlemania main event to feature a non-North-American native, Becky, whose real name is Rebecca Quin, defeated Rhonda Rousey and Charlotte Flair in a ‘triple threat’ at the Met-Life Stadium in New Jersey, to take the WWE RAW Women’s Championship and WWE Smackdown Women’s Championship belt. Becky ‘The Man’ Lynch is credited with revolutionising women’s wrestling through her incredible performance at WrestleMania 35 against Rhonda Rousey and Charlotte Flair. Originally from Limerick but raised in Dublin, the 32-year-old who is known to fans as ‘The Man’ is credited with revolutionising women’s wrestling through her incredible journey to the top. A wrestling fan since childhood, Lynch began wrestling in her teens and left University College Dublin to follow her dream. At age 18, Becky made her way to Canada to pursue a career as a pro wrestler. After making her mark in Canada, disaster struck when Becky suffered a head injury during a 2006 competition in Germany. In her time away from the squared circle Lynch worked as cabin crew for Aer Lingus and later studied drama at the Dublin Institute of Technology. She joined World Wrestling Entertainment (WWE) in 2013 and has since gone on to become a four-time women’s champion. After her amazing victory, Becky took to Twitter to tell her fans “Unthinkable to think what was once unthinkable. Those 3 seconds last night were a lifetime in the making. Thank you to all of you who have been on this crazy whirlwind journey with me. We’re only getting started”. After her incredible win on Sunday, Becky Lynch told WWE’s official media team that her victory now means that ‘anything is possible’. She said: “It’s hard to put into words how I’m feeling right now, it’s so overwhelming. I’ve worked for this my entire life, I’ve dreamed about this. ← Previous Story WATCH – Limerick rapper MC NOTN makes it to Semi-Finals of Ireland’s Got Talent 2019.